Fairy Cottage and Garden..... Re- Enchanted Life of a Domestic Mystic: Garden Food ! 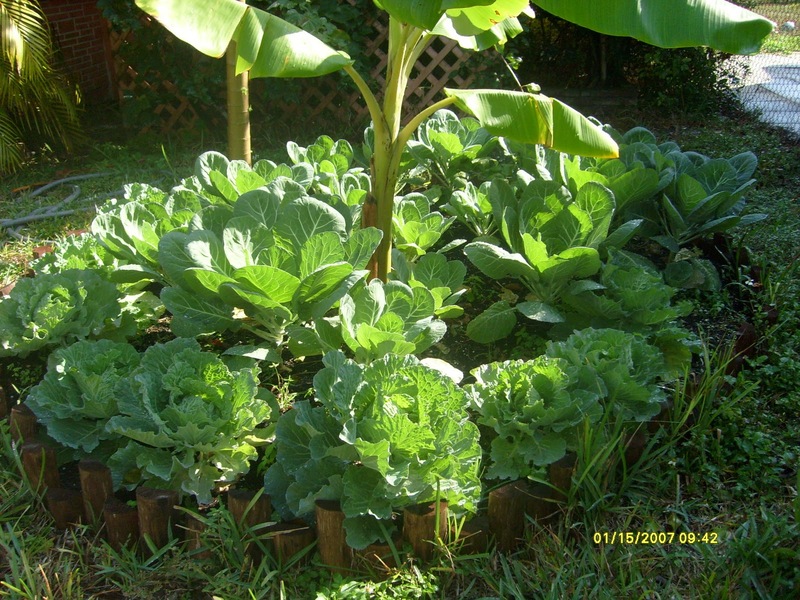 I have been trying to learn how to garden in sunny south Florida, and have finally had some success with raised beds and lots of peat moss and my own lovely compost. I am growing quite a few things now and the first thing when I open my eyes in the morning, I want to see what my lovely Green Friends have done overnight. A couple of days ago I wanted to have a rich experience and as my mind began to wander I was quickly brought to my own garden...instead of looking for an ''experience'' I decided to BE the experience! and to make a meal entirely from my gardens' produce. I had some lovely cabbages, and sweet onions, many varieties of herbs and came up with 2 dishes I could make that afternoon. One was a beautiful raw salad of cabbage, sweet onion, heirloom tomato, green onion, sage, marjoram, cilantro, and basil. 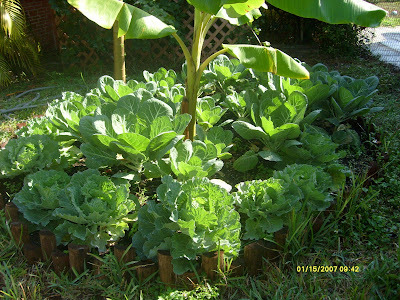 I cut the cabbage from its earthly base, and brought in what looked like a huge flower with a green ball in the center. The green ball being the cabbage hidden in tightly woven leaves, and the flowering petals were the outer leaves, ruffled, and deeply veined with lots of crevices making it look like the petals of a large flower. I cut some of the ''petals'' or leaves for the other dish, and then cut the ''ball'' or the cabbage out from the leaves, and was left with large petals. I made my wonderful salad and dressed it with organic olive oil, raspberry vinegar, Himalayan pink salt and fresh cracked pepper and served it in a wooden bowl, and put the bowl in the center of the large cabbage ''petals''....the result was a gorgeous raw salad, presented in a truly organic and beautiful way! The other cabbage dish was with a Thai sauce using, dates, raw almond butter, nama shoyu, garlic, ginger, jalapeno and lime juice all blended to make a divine Thai sauce I cannot begin to describe. It has all the taste elements of salt, sweet, pungent, sour and hot which is a recipe for perfection. Then I cut up the cabbage into shreds and also shredded some green onion, and added the Thai sauce and mixed it well. 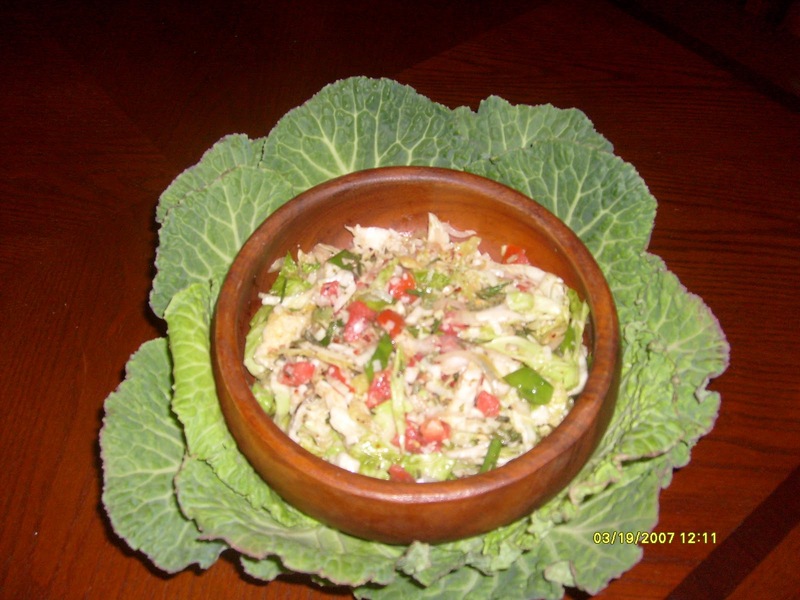 I then took some of the cabbage petals or leaves I had removed and layed some salad on top and rolled them and ate them....how yum was that! All raw, all organic and from my own garden! No pics for those, they went straight from bowl to mouth. I had an adventure of culinary delight bordering on bliss right at home! Welcome to the Fairy Cafe and Gardens !